Leaving Monday for Bogotá, where I will be attending the International Seminar of Architecture hosted by the Universidad Piloto de Colombia and leading a couple of workshops on representation. I’m excited about experiencing Bogotá, working with the students, and doing some sketching myself. 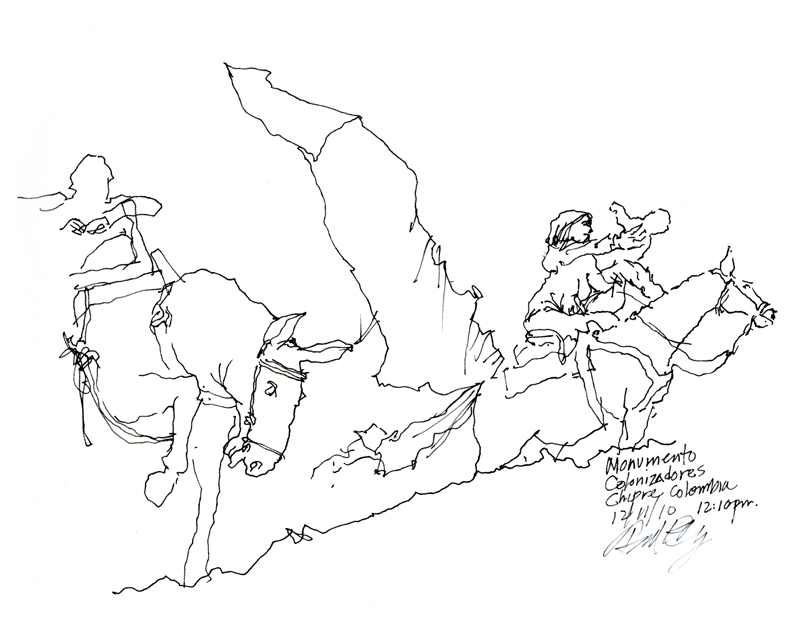 In the meantime, here are a couple of sketches I did the last time I was in Colombia, in 2010, attending a conference on methods for teaching beginning design students held at the Universidad Nacional de Colombia in the beautiful hilltown of Manizales. The first is of Iglesia de la Inmaculada Concepción, which fronts on Parque Caldas, with the statue of Francisco José de Caldas in the foreground. Caldas was a naturalist and geographer who was executed by the Spanish when Colombia (New Granada) was struggling for independence. 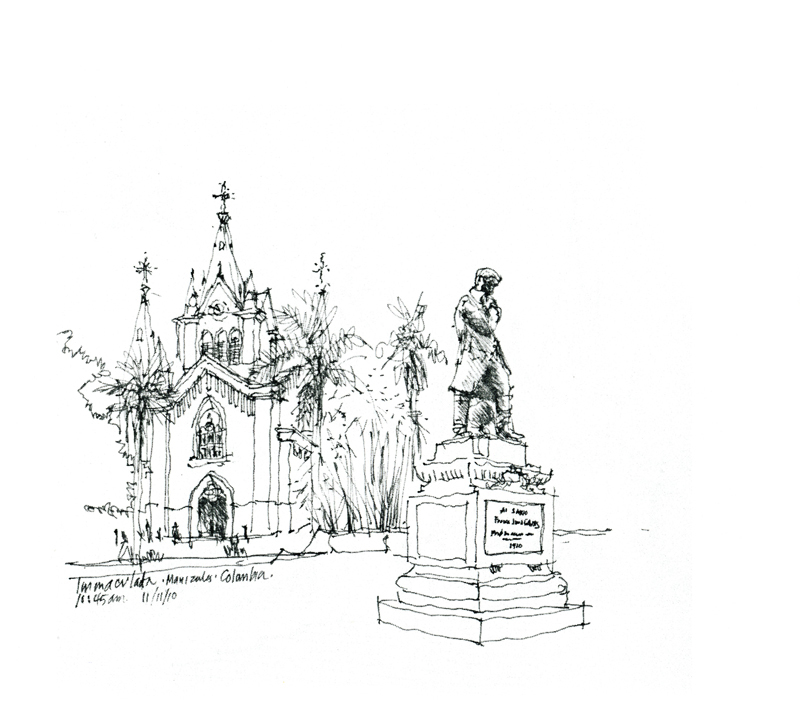 The second sketch is a fragment of a 50-ton bronze sculpture situated above Manizales in the neighborhood of Chipre. The monument pays homage to those who settled the region and founded Manizales. I tried to capture the struggle of the settlers, captured so eloquently by Luis Guillermo Arias, with a simple line drawing. 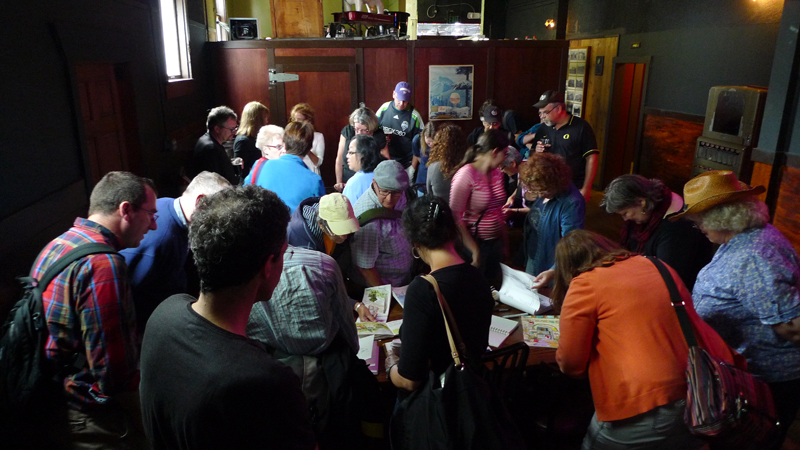 We had a tremendous turnout yesterday when the Seattle Urban Sketchers group met in the Georgetown neighborhood for the monthly meet up. Here’s everyone gathering to share their work in the rear room of Jules Maes Saloon, which has been around since 1888! When I took out and uncapped my usually trusty Lamy fountain pen, I found it had a very bad leak but fortunately, I had a Copic Multiliner as a backup. The 0.7 mm point was a little thick for my taste and the change of instrument really affected my drawing. 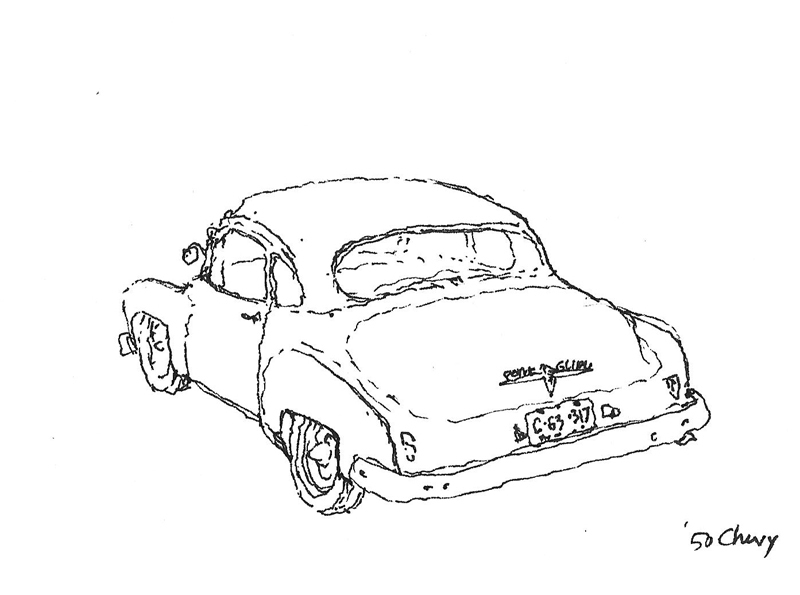 While walking the streets of Georgetown, I happened upon this beautiful ’50 Chevy Sport Coupe. It had an elegance of proportion and flow of line that was both captivating and difficult to capture. My first attempt began as a contour drawing and I found it difficult to work from where I started, at the rear window, to the other parts of the body and to maintain control of where the drawing was leading. 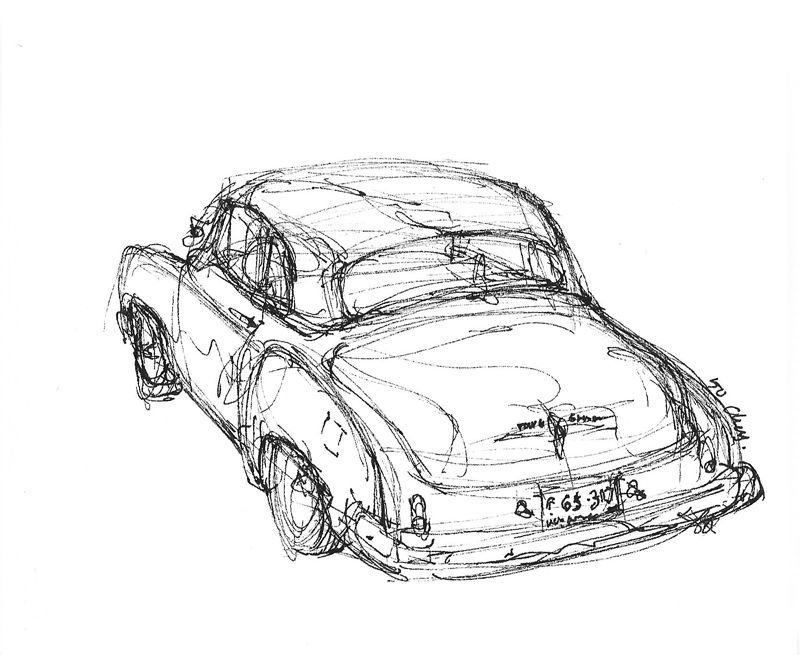 In my second attempt, I decided to use a more tentative, swirling line to first rough out and then refine the overall form and proportions of the cab and the hump of the trunk that rose from the aerodynamic body. With this method, I could make subtle adjustments to the overall form as the drawing progressed. Neither of the two sketches manages to capture the style and grace of this breakthrough in Chevrolet’s body designs but drawing in this manner really made me notice details and subtle relationships that would normally have gone unseen. 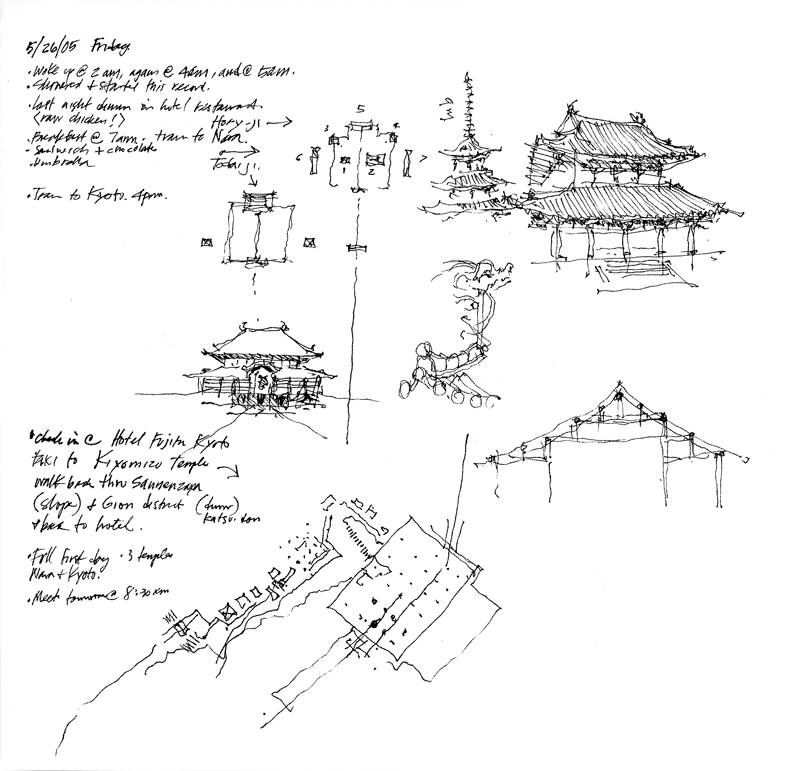 In my Japan sketchbooks, my favorite page contains neither personal notes nor drawings but rather a pilgrimage “stamp” from Kiyomizu-dera, a Buddhist temple and UNESCO World Heritage site in Kyoto. It was and still is customary for pilgrims in Japan to collect these stamps in a book from each Buddhist temple or Shinto shrine visited. While some temples may only give stamps, at others a temple priest will hand-draw the temple’s “signature” in the pilgrim’s book for a small fee, as was done here. 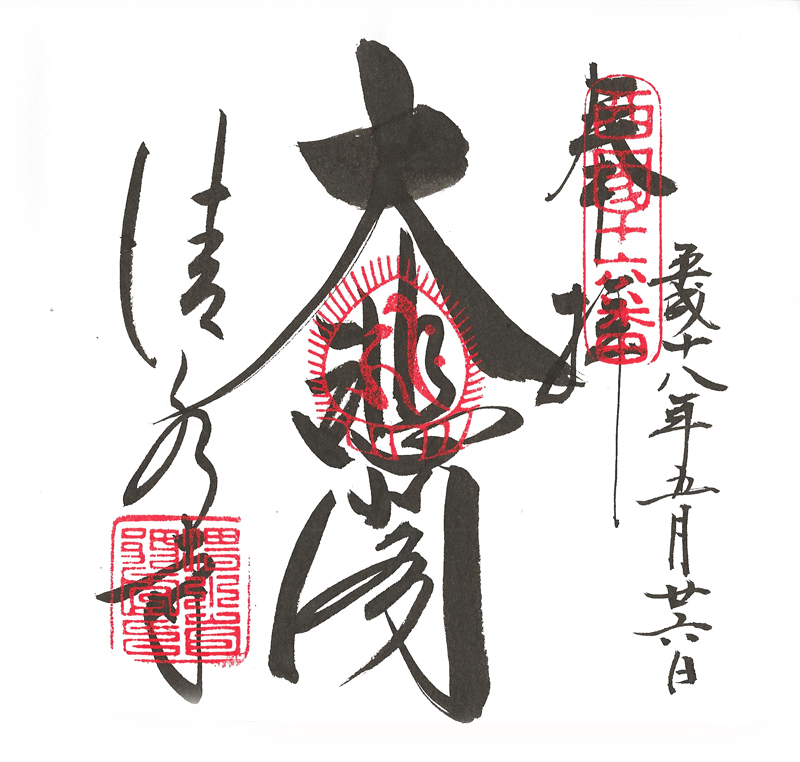 Beautiful calligraphy, artfully composed. When Jackie Helfgott, professor in the Criminal Justice Department at Seattle University, told Kim about the Seattle Urban Sketchers group, Kim suggested that we offer a drawing workshop at the monthly session of the If Project to offer another way for the women at WCCW to express themselves. 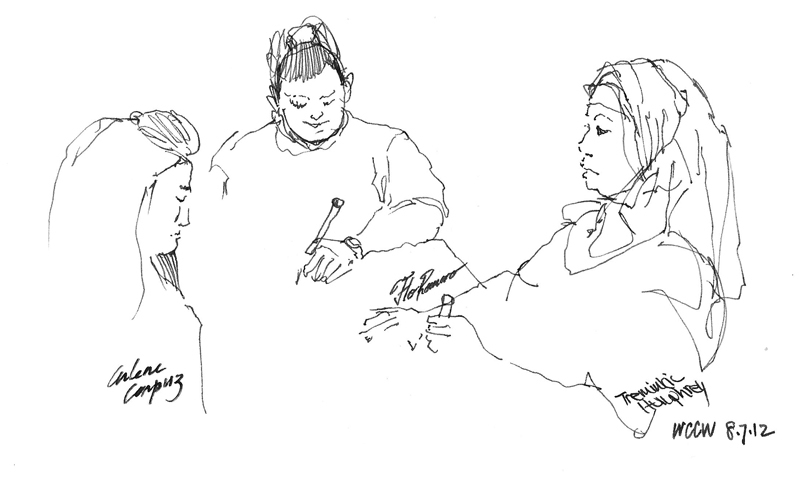 And so Tuesday evening, eight Seattle Urban Sketchers visited WCCW for a few hours. We didn’t know what to expect as we checked in and walked through the series of secured gates and doors. Upon meeting the group of more than 40 women, Gabi Campanario first asked what their expectations were. Some had drawing experience; many did not. “I can’t draw” was a common refrain, to which Gabi replied: As long as you can hold a pen or pencil and make a mark on paper, you can draw. 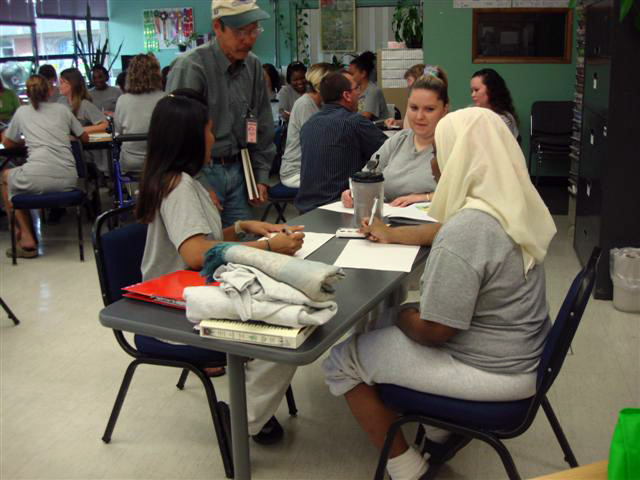 So one goal of the workshop was to instill confidence and make drawing an enjoyable and reflective activity. Gabi gave them several warm-up exercises, which then led to more varied choices of media and subject matter. While some women continued drawing from observation, others veered off to drawing from the imagination. It didn’t matter since drawing is essentially a form of visual expression, no matter what media we use or to what end we draw. The women were engaged, friendly, and perceptive, and many shared their aspirations. To paraphrase what one woman said after the workshop: Drawing took me away from where I am for a few hours. 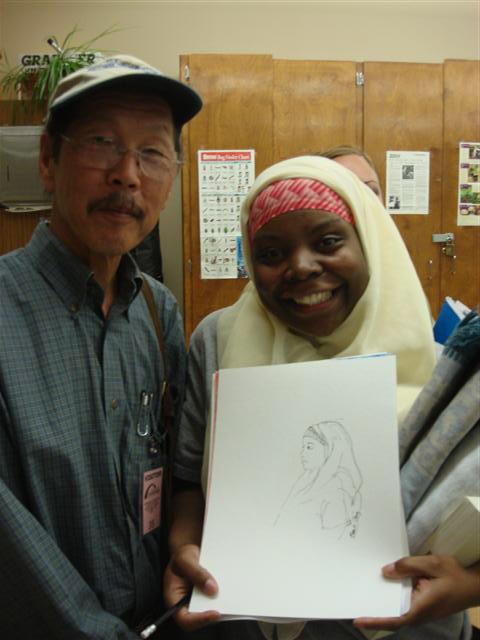 Here is a quick sketch of one group drawing and a photo with Tre, who had asked me to sketch her portrait. 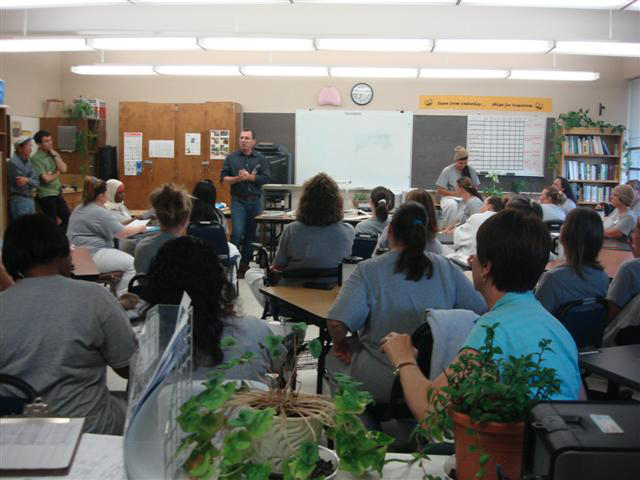 I hope it was as gratifying for the women who attended the workshop as it was for us to be there for a few hours. On the drive back to Seattle, it was difficult to process my thoughts but what struck me the most was that we could return home afterwards and the women could not. My brother and nephew from Austin and my sister from Honolulu were in town for a family reunion and to help celebrate my wife’s birthday. Since eating at a Chinese restaurant is a time-honored event when we get together to “talk story,” the family gathered to share a meal at Kau Kau Chinese restaurant in the ID district, which I think has the best char siu (barbequed pork) in Seattle, so juicy, tender, and sweet. During the dinner, my grandnieces, Ruby and Scarlett, drew on pieces of paper as kids often do when given the opportunity. Here are two drawings on postcards I had given them; you might recognize me in the drawing to the left! 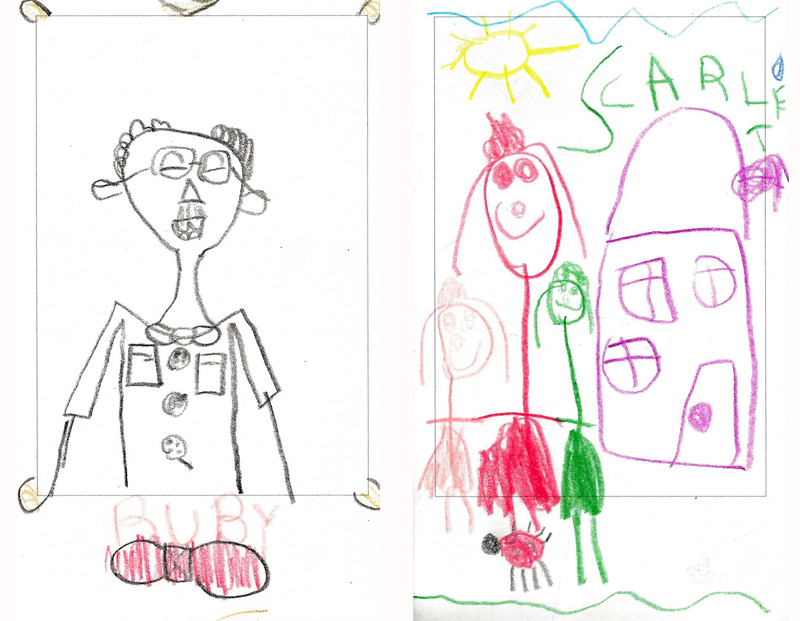 These drawings are so delightful—intuitive, honest, and uninhibited. I am not sure why but we often lose these qualities in our drawings as we grow older and we have to work really hard to recapture and retain that innocence.